I know this is so overdue, it’s now late November and this is a Halloween post but I couldn’t let all the fun of our annual halloween party sneak by without detailing some highlights right here. I loved these vases, I just got some cheap vases of different sizes at the dollar store and filled them with halloween candy, some black roses and some black sticks with skeletons. 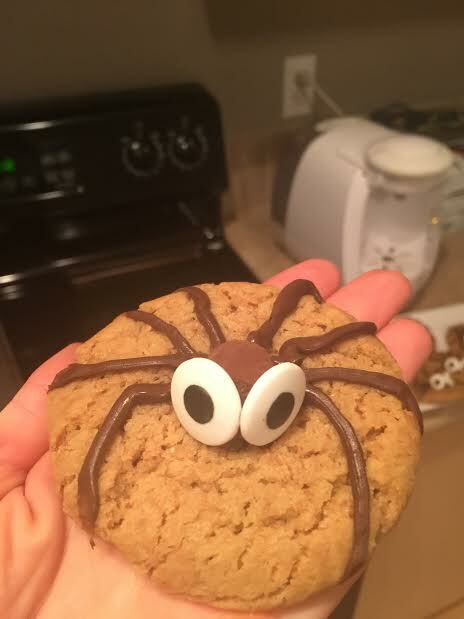 How cute are these spider cookies?! They are just peanut butter cookies and as soon as you take them out of the oven you press the back of a teaspoon on the top to make a little divot. Once they are completely cool I used a drop of melted chocolate as glue and stuck a mini peanut butter cup on top as the body, then piped the legs with melted chocolate. I also stuck the eyes on with melted chocolate, the eyes you can get at bulk barn and Michaels. I love them, I think they turned out so well. I was hoping this veggie platter would look like a candy corn but only a couple people I asked could identify that! That was an ice hand in the punch bowl, that punch would come back to haunt me the next day. How awesome is this dip? My friend Hollie brought it and I thought it was so well done. My girlfriend Erin also made cheese bread bones that were delicious but once they were baked and expanded they looked more like penises than bones! Scarecrow and crow. I am just obsessed with that headpiece Ryan wore, he was such a good sport about it – he was basically just covered in feathers. I took a ball cap and built the beak out of bristol board and then wrapped the head around and around and around with black feather boas. Mr. Monopoly and a sugar skull. Elliot! This was my absolute favourite costume of the night. Marty McFly, I wish I had a full body pic because the costume was bang on. Garth was kicking around somewhere too, Hollie and her husband were identity thieves which was actually quite creative, they went from person to person and after talking to them would take their names and stick them all over their hoodies. Things were starting to get a little messy at this point! Erin was the Lion King, Lisa was Snow White. There were so many creative costumes, I love seeing what people come up with. Ryan’s birthday was the week before and it was pretty low key and just the two of us went to dinner, he didn’t do anything with his friends. I decided to have a custom cake made and gave it to him at the party when all his friends were there too. It was amazing!!! The girl who makes them is so so good, her cakes are so creative and really well done. I just told her some things he likes and that I wanted to incorporate and she just went to town. I was so so happy with it. I love this photo of me giving the cake to him, good paparazzi skills guys! The next day I was not in a good way, I only left the house to pick up the dog. Then I laid on the couch until 4:30, threw up three times and then ate a pizza. Classy! I was glad I felt better in time to hand out candy though. Ryan was feeling ok the next day and him and his friend decided to go out. When I cleaned up from the party I threw out everything including his costume (he was not thrilled), so we threw together a last minute costume to go with his friend Dave’s existing costume. 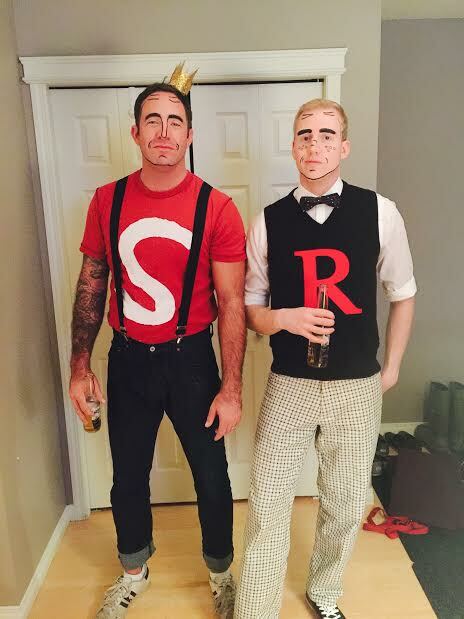 Jughead and Archie! I know the shirt with the S looks pretty thrown together but I just love the costume, we stole the crown from Erin’s lion king costume and then just took things from the closet and had a Jughead look ready to go! Well done! It all looks awesome, so festive!